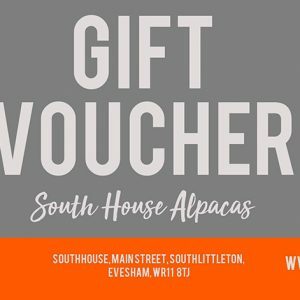 Look no further than South House Alpacas, wether you fancy dipping your toe into the wonderful world of alpacas or immersing yourself into ‘all things alpaca’ we have the answer here! Book a trek! Get up close and personal with a furry friend, learn how to handle, halter and take him for a walk in the beautiful surrounding countryside. Or, for those of you who have already fallen for these gorgeous creatures, choose your own from our wide selection alpacas. We will help and guide you all the way, and provide ongoing support and training. Existing owners, can choose from our handsome studs to provide stunning cria to add to your herd. Alternatively, just shop! For gorgeous South House alpaca duvets and pillows, T-shirts and mugs. Why not buy an unusual gift for someone special for Christmas or a Birthday! Our new Alpaca Trek for 2 is perfect! Click HERE for more details. We also offer Gift Vouchers for staying in our rooms, when booking just tick the Gift Voucher Checkbox. Click HERE to book rooms.